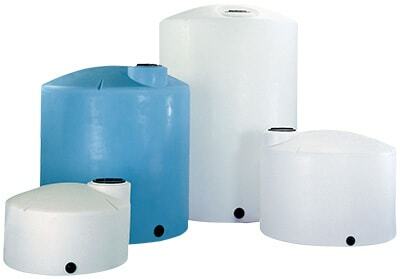 We offer a complete line of plastic vertical tanks. Our vertical tanks range from 10 to 20,000 gallons. Our tanks are made from FDA approved HDPE plastic and is UV stabilized for outdoor use. Most of our plastic tanks are available in 1.5, 1.7, 1.9 or 2.0 specific gravity. All of our tanks come standard with a lid or manway. They also come standard with a drain fitting. We can also add additional connections to our vertical tanks to meet your need. Please contact our sales staff with questions or pricing. Common uses for our plastic vertical tanks is storage of water, fertilizer, chemicals, DEF, and more.